A compromise measure to effectively end the state’s fiscal bailout of Hartford after five years has stalled in the House — because of opposition from Bridgeport and New Haven. 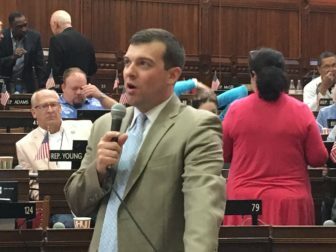 While House Majority Leader Matt Ritter, D-Hartford, said the bailout revision measure was not dead, he did say its future is uncertain as the legislature closes in on its midnight Wednesday adjournment deadline. The Senate voted 28-6 on Saturday to adopt a bill that would reduce non-education aid to the city by an amount equal to the emergency debt assistance Connecticut contractually pledged to Hartford this spring after five years. It set the same limit for any similar bailout of another distressed community. The city runs a deficit in excess of 2 percent of annual operating costs in a given fiscal year. The bill also stipulates the state’s Municipal Accountability Review Board (MARB), a panel of fiscal policy experts which authorized a major debt assistance deal for Hartford, could not do so for another city or town in the future without first clearing the plan with the legislature’s budget-writing committees. Rep. Steven J. Stafstrom, D-Bridgeport, asked what happens, in future years, if his city or another urban center, needs emergency help to avert bankruptcy, just as Hartford did after Mayor Luke Bronin said last year his city was on the brink of insolvency? 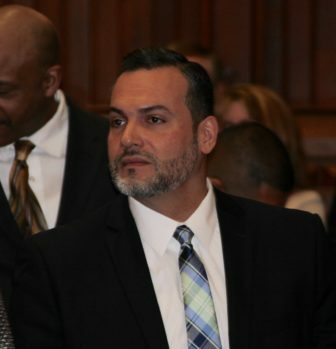 Some of the proposed changes “are very unfair for any other city going forward,” said Rep. Juan R. Candelaria, D-New Haven, who said empowering the legislative committees to potentially block accountability board actions injects politics into a process that should be left up to fiscal policy experts. “If it has to go through a political process, it will never pass,” he said. Under a debt assistance deal signed earlier this spring by Gov. Dannel P. Malloy’s administration and by state Treasurer Denise L. Nappier, the state will pay off the entire principal on Hartford’s general obligation debt, about $534 million, over the next two or three decades — as well as an undetermined amount of interest. The total will depend on how the city’s debt is renegotiated with bondholders. “I think everybody in this building thought this bailout for Hartford was always going to be a two-year deal,” Fasano said. Malloy and Nappier both say the deal complies with the authorizing language the legislature enacted, and that some lawmakers did not understand what they voted for. Regardless, some Hartford legislators and others argued, the capital city needs more than two years of help to keep back on sound fiscal footing. The city is home to two major hospitals, and several public and private colleges and universities — all of which are property-tax-exempt. It also faces major pockets of poverty and high property tax rates and provides the bulk of the region’s social services. Neither Bridgeport nor New Haven has approached the state for emergency assistance to date. But Stafstrom and Candelaria said their respective communities struggle with many of the same challenges Hartford does — problems that have taken a toll on municipal finances for decades. So is the House likely to vote on the bailout modification bill before the session ends? Ritter could not say for certain late Tuesday morning.